Australia 4 Wheel Drive Hire is the Australian based 4 wheel drive rentals experts and specialists. Search for and find all 4 wheel drive rentals, 4x4 wagon rentals, 4 wheel drive camper rentals, 4wd campervan rentals, motorhome hire, RV rentals, camper hire, 4wd wagon rentals online from our dedicated licensed Darwin Top End Australian based Specialists. Australia 4 Wheel Drive Hire.com - Choose a Australian 4 wheel drive car hire return or oneway rentals from branches in Adelaide, Alice Springs, Brisbane, Broome, Cairns, Darwin, Melbourne, Perth and Sydney depots. Our range consists Amarok or Toyota Landcruiser 76 series Workmate Wagon or similar options. • We even have 4wd offroad camper trailer and 4wd car wagon hire from Darwin and return to Darwin. • Look at our current Australia 4wd hire specials. • To Kata Tjuta the Olgas and Kings Canyon. • Red Centre Way selfdrive route. • Rock Art at NDhala Gorge. Australia - Self drive to one of the most picturesque routes would be the Black Spur in Victoria, Australia in a 4wd camper or Luxury RV motorhome hire. • About the Black Spur in Victoria Australia - • One of the most picturesque routes would be the Black Spur in Victoria • Total distance: 27.9 kilometres. Australia - Self drive to the Ettamogah Pub from Sydney the most famous carziest pub in Australia in a 4wd camper or Luxury RV motorhome hire. It is located at Cnr Merriville & Windsor Rds Kellyville Ridge, New South Wales, 2155 • The Ettamogah features a large beer garden, dedicated children's play centre and weekly jumping castle, pony rides and a face painter, the Ettamogah is a family friendly hotel. Our Bistro is open 7 days with an extensive affordable menu, 3 dedicated function rooms and multiple bars suitable for any occasion. • Ring and check first though - Bring the kids to the Etta on any Sunday and they can enjoy jumping on the Jumping Castles, Playing in the Play gym, Petting the animals in the Petting Zoo or getting their faces painted. Then every Sunday we have something special to do! It could be seeing the reptile show, riding the Bucking Bull, riding the ponies or getting an airbrush tattoo… AND its ALL FREE!!! • • The Ettamogah Pub is a cartoon pub that was featured in the now defunct Australasian Post magazine. Australia - Self drive to the Katherine Gorge from Darwin in a 4wd camper or family RV motorhome hire. • About Katherine Gorge Australia - • This 292,800 hectare National Park is owned by the Jawoyn Aboriginal people and jointly managed with the Parks and Wildlife Service of the Northern Territory. Some of this Park's amazing features include spectacular dissected sandstone country, broad valleys and numerous, significant cultural sites. Australia - Self drive from Cairns around outback Queensland and explore it's famous beaches in a 4wd camper or Luxury RV motorhome hire. • About the Great Barrier Reef Australia - • The Great Barrier Reef is the largest coral reef system in the world. • It is found in the Coral Sea, off the coast of Queensland, Australia. • The Great Barrier Reef is the world’s largest living structure. • It is made up of around 2900 individual reefs and 900 islands. • The Great Barrier Reef is around 2600 kilometres (1616 miles) in length. • Astronauts can see the Great Barrier Reef from space. • Marine animals called coral play an important role in the formation of the Great Barrier Reef. • Coral create calcium carbonate which forms a hard, shell-like skeleton. • The Great Barrier Reef is home to a wide range of life, including fish, sea turtles, giant clam, seahorse, sea snakes, nudibranch, sea turtles, stingray, sharks and many more. • Over 1500 different species of fish live in the Great Barrier Reef, including clownfish, star of the animated film Finding Nemo. • Whales, dolphins and dugong can also be seen in the Great Barrier Reef. • Climate change is perhaps the biggest threat to the Great Barrier Reef. • Warmer ocean temperatures put stress on coral and lead to coral bleaching. • The Great Barrier Reef is a popular tourist destination with around 2 million visitors every year. Courtesy www.sciencekids.co.nz. • About the Murray River Australia - • The Murray is the third longest navigable river in the world, after the Amazon and Nile • Total length - 2520 kilometres from its source in the Upper Murray and the Kosciusko National Park. Australia - Self drive The Great Ocean Road from Melbourne to Adelaide in a 4wd camper or Luxury RV motorhome hire. • About The Great Ocean Road Australia - • Whales are often sighted along the Great Ocean Road and Winter is the perfect time to see these magnificent creatures of the sea. Walk at your own pace along the Great Ocean Walk and take a short walk of up to 3 hours long or Explore the Great Ocean Walk on a day walk and witness breathtaking ocean views and natural wonders. • Discover kilometres of clean, golden sand and majestic waves along the Great Ocean Walk. • There are attractions, activities, events and features throughout the region to suit all ages and interest groups. From theme parks for children to adventure sports for adrenaline junkies. From gourmet food and wine experiences to bushwalking through campsites. From a simple dip in the ocean to a luxurious spa retreat. There really is something for everyone. • Great Ocean Road touring map PDF external link • The Great Ocean Road is an Australian National Heritage listed 243 kilometres (151 miles) stretch of road along the south-eastern coast of Australia between the Victorian cities of Torquay and Allansford.• Enjoy the Great Ocean Walk by day and retire to your bed at night from resorts to cottages. • Feel the freedom of walk in, walk off camping along the Great Ocean Walk at a variety of campsites. • About Litchfield National Park Australia - • Together with stunning tropical waterfalls and swimming holes, this is a truly beautiful destination found just south of Darwin, the capital city of the Northern Territory. Litchfield National Park features numerous waterfalls which cascade from a sandstone plateau called the Tabletop Range, monsoon rainforests, intriguing magnetic termite mounds and historical sites. Litchfield National Park is chosen by local Darwin residents and tourists as 1-3 day destination for it's waterfalls and magnetic termite mounds. Also noted are the 4WD tracks into some of the more remote parts of Litchfield National Park and surrounding region. Litchfield National Park lies approximately 130km's southwest of Darwin near the town of Batchelor and covers around 1,500 sq km's. The Bungle Bungle Range rises up to 578 metres above sea level. The range stands 200 to 300 metres above a woodland and grass-covered plain, with steep cliffs on the western face. Elsewhere, particularly where Piccaninny Creek has formed Piccaninny Gorge, the range is cut by deep gullies and breaks up into complex areas of ridges and domes, with prominent orange and black or grey bands. Where is it? - The turn-off to the park is 250 km south of Kununurra or 109 km north of Halls Creek. The park access road is accessible only to four-wheel-drive vehicles. Australia - Self drive to the Gibb River Road from Darwin in a 4wd camper hire. • About the Gibb River Road Australia - • Self drive along the Gibb River Road from Broome or Darwin is a Australia four wheel drive hire camper or wagon. The Gibb River Road was initially constructed as a beef road to transport cattle from the surrounding stations to the ports of Derby and Wyndham. It spans some six-hundred and seventy kilometres from Derby to the junction of the Great Northern Highway between Wyndham and Kununurra. On passing through a gap in the Napier Range, the majesty of the King Leopold Ranges comes into view. The road winds and twists its way through this magnificent area of sheer cliffs and water holes. Choose a Australian 4 wheel drive car hire return or oneway rentals from branches in Adelaide, Alice Springs, Brisbane, Broome, Cairns, Darwin, Melbourne, Perth and Sydney depots. • Our range consists Amarok or Toyota Landcruiser 76 series Workmate Wagon or similar options. Look at our current Australia 4wd hire specials. 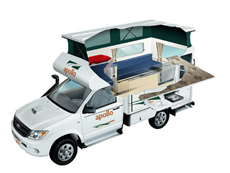 5 Seat 4WD Campers or 4WD Car with tents packages for camping hire called the Safari Camper sleeps up to 5 Adults with camping gear. Excellent setup camp early eve and enjoy the great outdoor and have your dinner at a 5 million star spot.